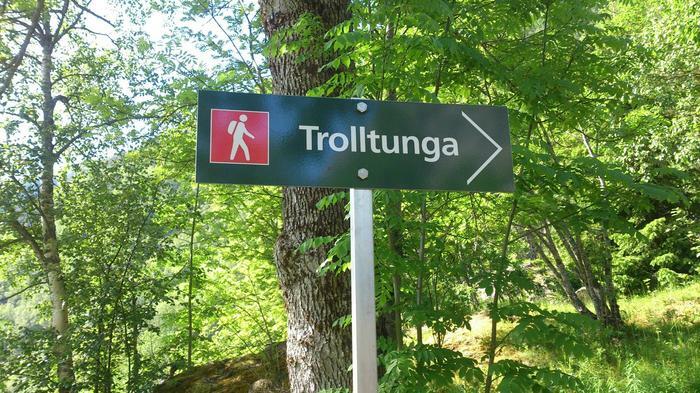 This is the gate to Trolltunga! Let us tell you the story about how it all started. See Trolltunga in a new perspective. The Hardanger Fjord is very accessible from Bergen; during the summer, steamers sail about six times a week, making the tour of the fjord. Sør Fjord, an arm of the Hardanger Fjord, runs due south, and is justly famed as the most beautiful part of Hardanger. The sides of the fjord are covered with orchards, and cherries and apples grow with great luxuriance. 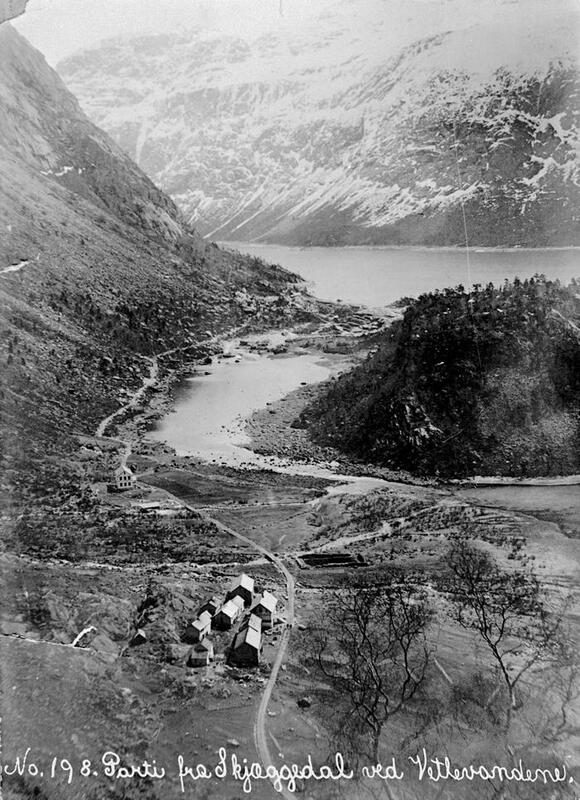 The steep mountains to the west are crowned with glaciers, offshoots from the great Folgefond ice-field, and on the eastern side are lofty and rugged mountains. The scenery increases in grandeur as you reach Tyssedal. 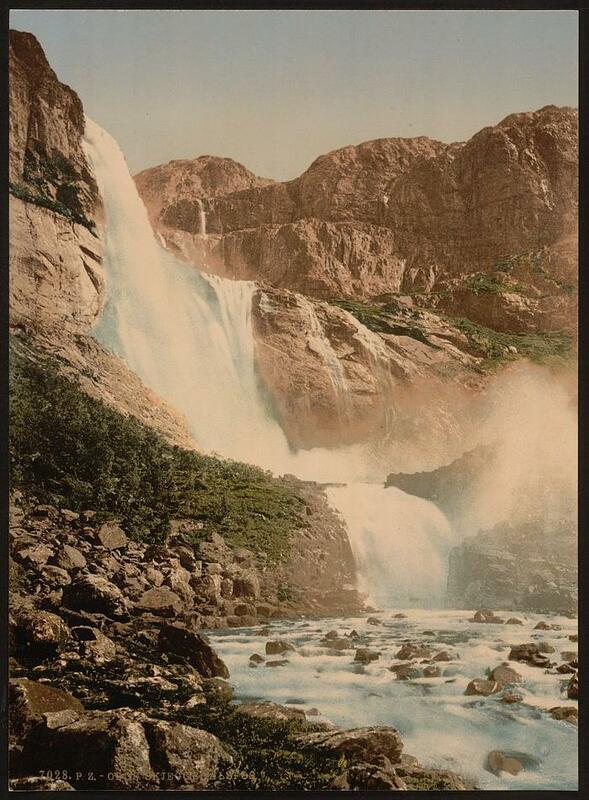 The great water-power, which has for centuries been running to waste, has at last been successfully bridled, and an electric power-station established for generating electricity, required for the carbide factory at Odda. Enormous turbines are driven by water obtained from the Ringedalsvand, and conducted to Tyssedal by a tunnel cut through the rock. Over 100 000 horse-powers are generated and conveyed to the works at Odda. The chief attraction of the fjord lies in the great ice-field of the Folgefond, and the wonderful waterfall of the Skjeggedalsfoss, which may be visited from Odda. The valley leading up from the fjord is remarkable for its stern and impressive grandeur. Landing beside the power-station, you follow the riding path on the left bank of the river Tysso, ascending most of the way, until you reach Skjeggedal, where there is a small hotel. Crossing the river, you come, in about ten minutes, to the Ringedalsvand, a fine lake about 6 kilometres long, at the end of which is the Foss. Here you get another motor-boat that brings you to the fall. 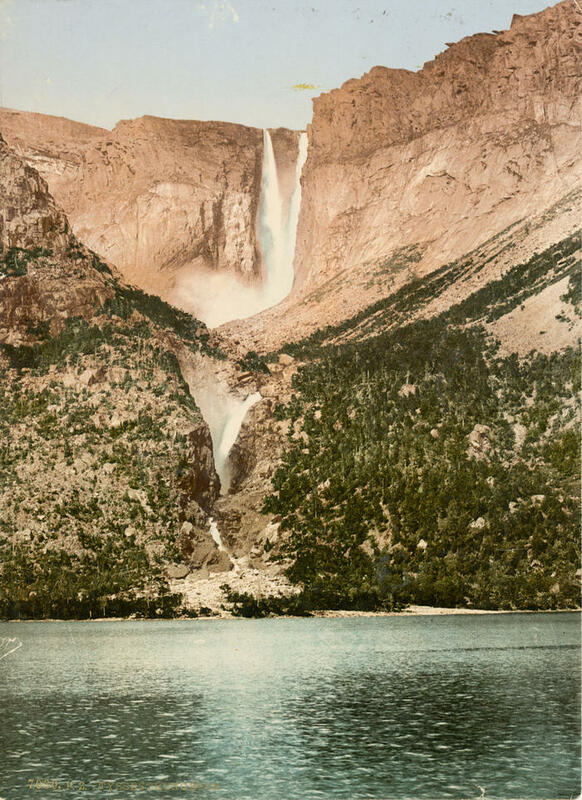 About half-way up the lake you have, on the left, the beautiful Tyssestrengene Fall, in which two rivers, which leap from the cliff, form one fall half-way down. 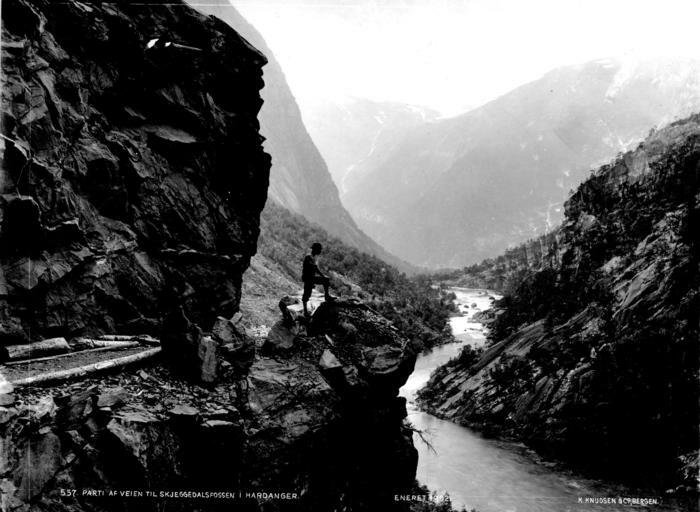 The scenery here is very beautiful, and looking back, there is a grand view of the Folgefond. In 40 minutes you land near the mighty Skjeggedalsfos, which has a sheer fall of about 522 ft. The total height of the fall, from the top to the lake, is about 1300 ft.
Vetlevatn lake was used as a forebay.The water supply tunnels pass through 3.5 km of solid rock before reaching the distribution pool at Lilletopp in the mountain above the hydropower station. The current dam was built of reinforced concrete between 1921 and 1924, years of crisis for the carbide market and the construction industry. The original dam functioned as an overflow reservoir, and mere planks were used to regulate the flow of water. Today little is left of the old valley. There is an old building, Skjeggedalsstova, at the old farmstead, and a restored mill by the river shows how the locals used water power in olden days. 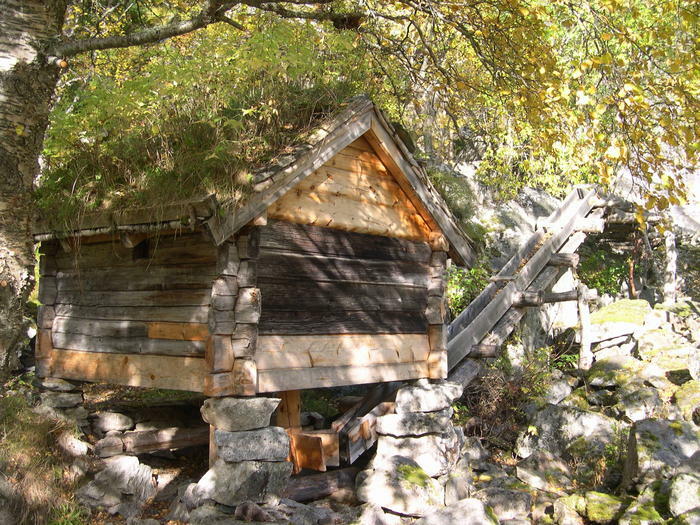 Water-driven mills such as this were used in Hardanger since the 14th century, and it was said that people who had a river near their farm had reason to feel rich. 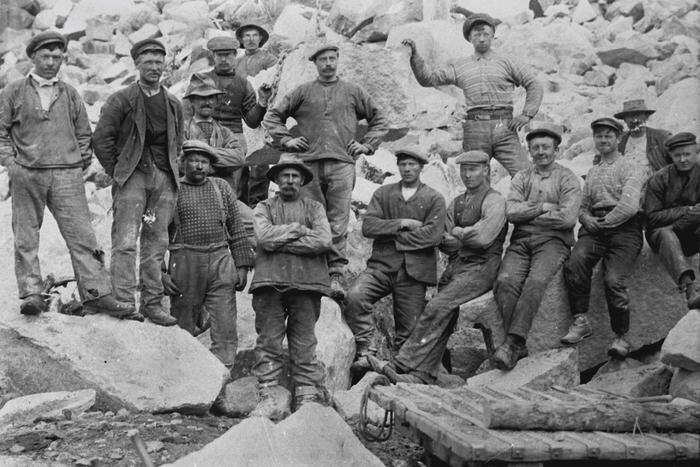 By the 50th anniversary of the power company A/S Tyssefaldene in 1956, the Mågeli watercourse had been regulated and a new power station at Mågeli completed. The Pelton turbines in the two aggregates are designed to produce 25 Hz power. In 1978 the facility was rebuilt, producing 132 million kWh per year at 50 Hz – 15 500 kW for each of the two aggregates. The maximum fall height of the water is 610 m. The watershed that supplies the power station encompasses an area of 60 km2. 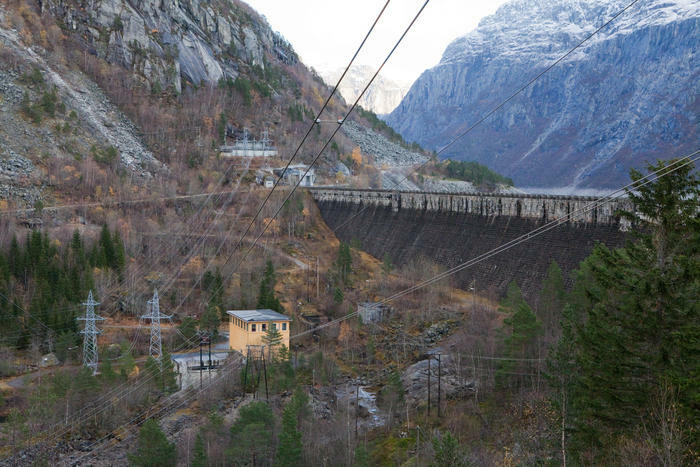 The Skjeggedal power station was built in 1938 in order to utilize the water from the Ringedal dam. 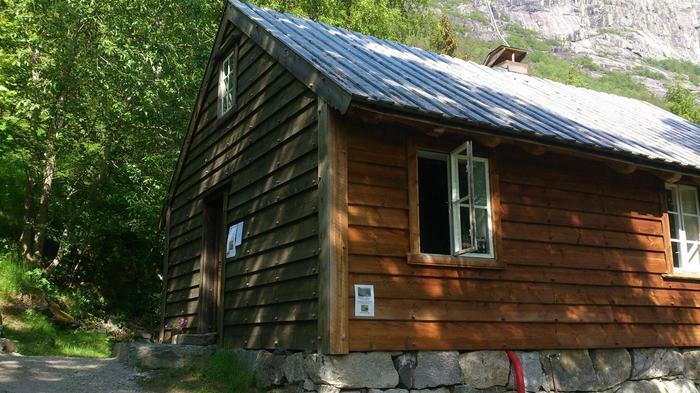 It was the first remotely controlled hydropower station in Norway. 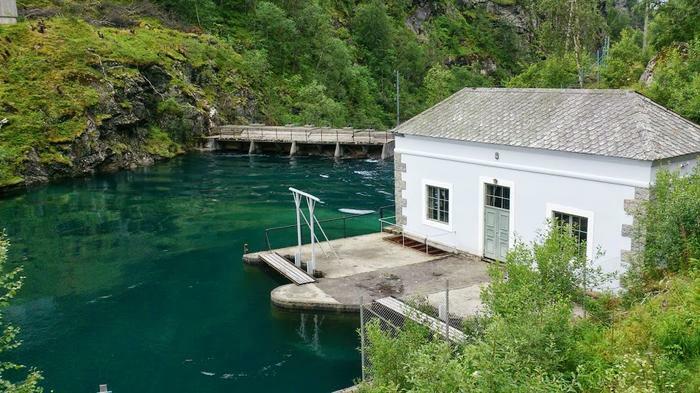 In 1980 it was closed down, and since 1986 it has merely been used as a pumping station, pumping as much as 9 m3 of water per second back up to the Ringedal dam when there is an energy surplus. 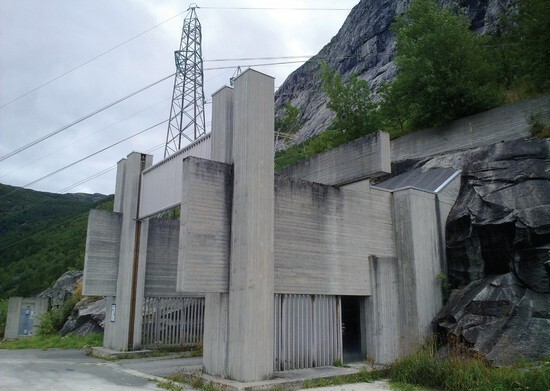 Some of the original equipment and instruments are displayed in Tysso I, the even older power station at the mouth of the valley of Tyssedal. As it now stands, Tysso II was constructed between 1964 and 1967, although detailed plans for the power station had been drawn up before the war. When these plans fell into the hands of the German occupation authorities, they tried to complete it for their own purposes. Up to a thousand construction workers were mobilized in Skjeggedal between 1941 and 1943, when the project was stopped. After the war, the power company, A/S Tyssefaldene, modified their plans. Tysso II, which was designed by the Bergen architect Geir Grung, opened on 21 September 1967. Tysso II is not visible in the landscape; it is buried 450 metres inside the mountain. 18.7 kilometres of pipeline tunnels from numerous small lakes feed its Pelton turbines. They are designed for 90 000 kW and produce 863 million kWh annually. 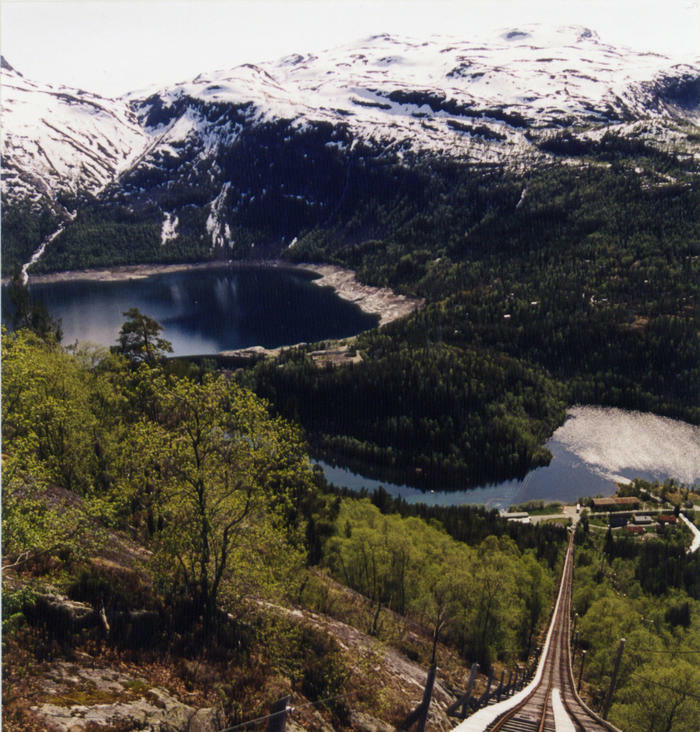 The drop to Ringedal dam is 735 metres. Ringedal dam is built of hand-cut granite and is the largest stone dam in Norway. The dam has a capacity of 407 million m3. A proud Ragnvald Blakstad, who was Director General of A/S Tyssefaldene from 1910 to 1918, had his initials cut into the face of the dam.